Citrus: Lemon, Lime, Orange, Tangerine, Grapefruit – Citrus spp. ‘Nagami’ – F. margarita Swing. Also called Oval or Long Kumquat. Fruits are longer than wide, 1-1 ½” long, with thin, yellow-orange peel. 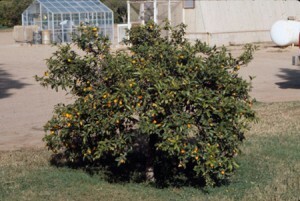 ‘Meiwa’, or Large Round Kumquat – F. crassifolia Swing. Possibly a hybrid between ‘Nagami’ and ‘Marumi’. Round fruit, thick orange-yellow peel. ‘Hong Kong’, or ‘Hong Kong Wild’ – F. hindsii Swing. Fruit is orange/scarlet when ripe, many seeds. ‘Marumi’ – F. japonica Swing. (syn. Citrus madurensis Lour.). Also called round kumquat. Thin, golden-yellow peel surrounds aromatic and spicy pulp. 2. Poncirus trifoliata L. Raf. – trifoliate orange trees. Important as a rootstock for citrus, especially in Japan, although the fruit is scarcely edible. 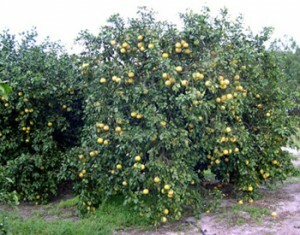 It is used as a male parent in production of citrange (sweet orange* trifoliate orange) rootstocks, and as an ornamental. It has a deciduous habit in cooler areas, and can tolerate more freezing than any other citrus relative. It is native to northern China, and grown as far north as Philadelphia in the eastern USA. C. sinensis (L.) Osb. – Sweet orange trees. This is a widely accepted name for this crop, containing 4 groups of cultivars: common oranges, blood oranges, navel oranges, and acidless oranges (see below). The term “orange” is used rather loosely, sometimes for fruits that look like oranges but are not C. sinensis. 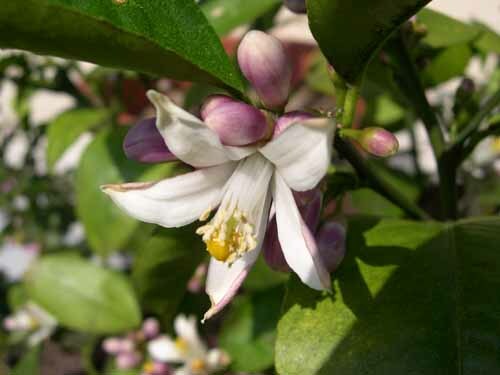 Examples include: ‘Temple’ and ‘Page’ oranges ( tangerine hybrids), Satsuma orange (a cold hardy variant of tangerine), and Trifoliate orange (Poncirus trifoliata). C. reticulata Blanco – Tangerine, mandarin, or satsuma. Due to the success of breeding with these types, many cultivars and hybrids have been produced or formed naturally, some erroneously given species status. I prefer to use C. reticulata for all tangerines, but other species names sometimes given in the literature include: C. unshiu (Satsuma), C. deliciosa (Willowleaf), C. reshni (Cleopatra), C. nobilis (King), and C. temple (Temple). C. paradisi Macf. – Grapefruit. This is clearly not a true species, but its economic importance today has granted species status that even a lumper could not deny. Grapefruit is thought to be a hybrid of pummelo and sweet orange that occurred naturally somewhere in the Caribbean between the time of Columbus’ voyages and its introduction to Florida in 1809. C. limon Burm. f. – Lemons. 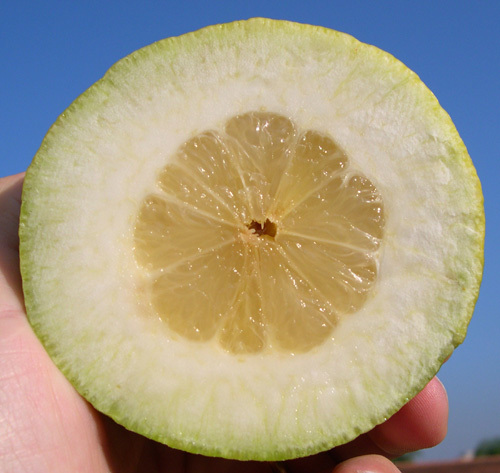 I would lump the rough lemon (C. jambhiri), sweet lemon (C. limetta), and Volkamer lemon (C. volkameriana) as variants within this species. C. aurantifolia L. – Limes. The literature distinguishes the two main cultivars – ‘Key’ and ‘Tahiti’ – as separate species, with the latter labeled C. latifolia Tanaka or Citrus X tahiti Campbell. I would lump these two, along with the ‘Rangpur’ lime (C. limonia) and sweet limes (C. limettioides), all under C. aurantifolia. C. grandis (L.) Osb. or C. maxima (Burm.) Merr. – Pummelo or shaddock. 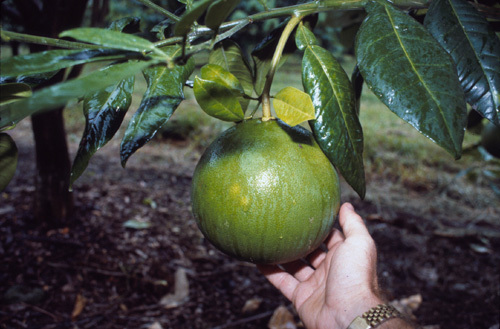 This species originates from southeast Asia where it is as common as grapefruit is in the USA. It is much larger and thicker-peeled than grapefruit, but said to have milder flavor. C. aurantium L. – Sour orange. This is allied with limes by some, but is a very important rootstock and ornamental. Cultivars and variants include: Bittersweet, Oklawaha, Vermillion Globe, Paraguay, Trabut, var. myrtifolia (Myrtle), Bergamot, daidai (Japanese), Leaf of Chinnoto, and C. taiwanica Tanaka. C. medica L. – Citron. This lemon-like fruit may be the progenitor species of modern lemons and limes. The peel is very thick, and the white, spongy portion of the peel is edible. Hybrids. Crosses of tangerine with orange (tangors) or grapefruit (tangelos) have produced many cultivars of importance in the USA. Grapefruit. The major white-fleshed cultivars are ‘Duncan‘ and ‘Marsh‘; the former is seedy and the latter seedless. ‘Thompson‘ (syn. 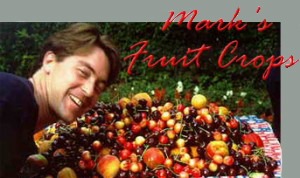 ‘Pink Marsh‘) was a mutation of ‘Marsh‘ with pink flesh, and is also seedless. Other deep red cultivars include ‘Star Ruby‘, ‘Ruby Red‘, ‘Rio Red‘, and ‘Flame‘, grown largely in Texas. Limes. ‘Key‘ (syn. ‘Mexican‘, ‘West Indian‘) and ‘Tahiti‘ (syn. Persian) are the major cultivars. ‘Key‘ limes are small, round, and seedy, and turn yellow under Mediterranean conditions. ‘Tahiti‘ limes are larger, green, and shaped like lemons. Lemons. The main cultivars are ‘Lisbon‘ (oval to round, more pronounced stylar end furrow and point) and ‘Eureka‘ (oval, less pronounced stylar end). 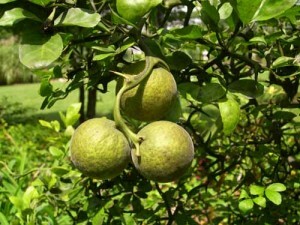 ‘Meyer‘ is a cold hardy, larger fruited cultivar used as an ornamental or containerized plant, and is probably a lemon hybrid. ‘Femminello‘ and ‘Verna‘ are the major cultivars in Italy and Spain, respectively. 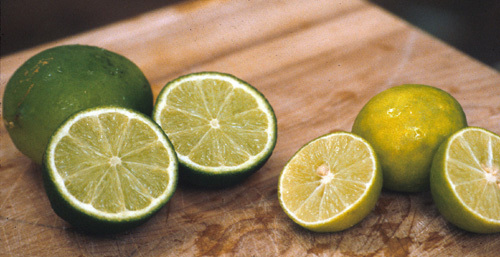 The two major lime cultivars are ‘Tahiti’ (on left – large, oval and seedless) and ‘Key’ (on right – small, round, and seedy). The ‘Lisbon’ lemon is the most common lemon in the USA. The center of diversity for Citrus ranges from northeastern India eastward through the Malay archipelago and south to Australia. Sweet oranges probably arose in India, the trifoliate orange and mandarin in China, and acid citrus types in Malaysia. Oranges and pummelos were mentioned in Chinese literature in 2400 BC, and later in Sanskrit writings (800 BC) lemons were mentioned. Theophrastus, the Father of Botany, gave a taxonomic description of the citron in 310 BC, classifying it with apple as Malus medica or Malus persicum. At the time of Christ and shortly thereafter, the term “citrus” arose as a mispronunciation of either the Greek word for cedar cones, “Kedros”, or “Callistris”, the name for the sandalwood tree. At this time, citrus fruits were spread throughout Asia, North Africa, and Europe along trade routes. The dissemination was carried out by many cultures, indicating widespread appeal of the fruits at this time. From the first centuries BC to medieval times, orangeries and citrus “groves” were established in Europe, and cultivation became more sophisticated. Christopher Columbus, Ponce de Leon, and Juan de Grijavla carried various citrus fruits to the new world in the late 1400’s early 1500’s. Citrus culture proliferated in Florida in the late 1700’s, when the first commercial shipments were made. Right about this time, citrus was introduced to California, although it was much later that commercial production began in the west. With the advent of large-scale irrigation projects in the 1940’s, citrus culture increased greatly in western states. Today, citrus fruits are grown commercially in Florida, California, Arizona, and Texas. World (2002 FAO) – 64,128,523 MT or 141 billion pounds. Oranges are produced commercially in 114 countries worldwide, on about 9 million acres. Worldwide average yields are just over 15,000 lbs/acre. Prices received by growers are among the lowest of any fruit crop in the USA: 5-15 ¢/lb, with fresh fruit receiving 10-15 ¢/lb, and processed about 5-6 ¢/lb. World (2002 FAO) – 4,979,781 MT or 10.9 billion pounds. FAO statistics include pummelo with grapefruit, so a small fraction of this amount is actually not grapefruit. Produced commercially in 74 countries worldwide, on about 653,000 acres. Yields average 16,700 lbs/acre. World (2002 FAO) – 18,792,909 MT or 41.3 billion pounds. Produced commercially in 60 countries worldwide, on about 4.2 million acres. Worldwide average yields are 10,600 lbs/acre. United States (2002 USDA) – 627,660 MT or 1.1 billion pounds. Value = $168 million. Yields range from 9000 lbs per acre in Arizona to 25,000 lbs/acre in Florida. Leading states: FL, CA, AZ (in order). The USA average price paid to growers is about 13-14 ¢/lb. World – (2002 FAO) – 11,227,173 MT or 24.7 billion pounds. Lemons and limes, as we know them in the USA, are not distinguished by the FAO. Thus, the following data are totals of lemon- and lime-like fruits. 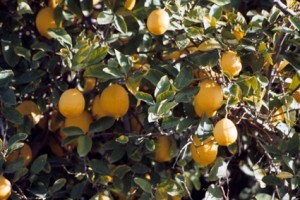 In Mediterranean climates (like Spain, Italy, and California), production of lemons dominates; in tropical and subtropical regions (like Mexico, Brazil, and Florida) lime production dominates. Lemons and limes are produced commercially in 94 countries worldwide, on about 1.9 million acres. Yields average 13,500 lbs/acre. Lemon. 1,095,160 MT or 2 billion pounds. Value = $341 million. California 86%, Arizona 14%. Yields are about 16,000 lbs/acre in Arizona and 32,000 lbs/acre in California. Prices are 12-15 ¢/lb. Lime. 6360 MT or 14 million pounds. Value = $1.7 million. Florida produced 100% of the limes in the USA, but hurricane and disease damage has all but eliminated the Florida industry. Acreage estimates showed 1000 acres in 2002, and less than 400 in 2003. Orange trees are small, spreading, evergreen trees or tall shrubs as with most other citrus trees. Grapefruit trees are the largest, and limes the smallest statured trees of the group. Trees may reach 20-30′ in height in nature, but most cultivated trees are <15′. Stems are often armed with long thorns, particularly limes, and in all types when young. Leaves are unifoliate (sometimes termed compound unifoliate to indicate the loss of lateral leaflets over time), relatively thick, ovate with acute to obtuse tips, having entire or crenulate margins, and stout, winged petioles of various width depending on species (grapefruit = wide, tangerine = narrow). Fragrant, white flowers are solitary or in short cymes, borne axillary on current flush of growth (“leafy bloom”), and also without leaves from the previous flush (“bouquet bloom”). Flowers are perfect, with 5 petals and sepals; petals linear, sometimes curved lengthwise, waxy, and thick; sepals fused at base to form a small cup. Ovary is compound with 10-14 locules in most commercial cultivars; position superior, and subtended by raised nectary disc. Most cultivars are self-pollinated. Some are parthenocarpic (e.g., ‘Tahiti’ lime, and some Navel oranges and tangelos). Cross pollination is necessary only for some tangerines and tangerine hybrids. Citrus fruits are so important that they have received a special name – a hesperidium. A hesperidium is basically a leathery rinded berry. The endocarp is the edible portion, divided into 10-14 segments separated by thin septa, each containing up to 8 seeds, but usually only one. Each segment is composed of juice vesicles (“pulp”), with long stalks attached to the outer wall, containing juice. Citrus seed is unusual compared to most fruit crops because it forms nucellar embryos (maternal clones) in addition to the zygotic embryo produced through fertilization. Exceptions include some tangerines and the pummelo, in which only a zygotic embryo forms. The condition is termed nucellar embryony or polyembryony, and it allows clonal propagation of citrus by seed, which is rare in horticultural crops. This condition is exploited by nurserymen, but presents obvious difficulties in citrus breeding. Multiple embryos per seed ensures that germination rates often exceed 100%, and production of uniform seedlings in high percentages simplifies clonal rootstock production greatly. In other fruit crops, clonal rootstock production requires some form of layering and an extra year in the nursery, raising costs of tree production. For breeders, variation in seedling progeny is low or non-existent since most seedlings arise from nucellar embryos, and are thus clones of the maternal parent. Wide variety of soil types and conditions – almost pure sand in central Florida, to organic muck near the Everglades, to loamy, heavy, high pH soils in the San Joaquin valley of California, tolerant of high or low pH and salinity. 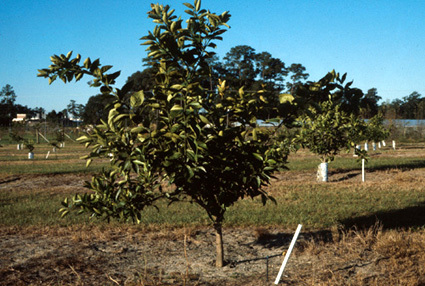 Citrus species generally do not tolerate soil flooding for more than a few days without injury. Most citrus perform best in subtropical climates, where there is a slight change of season but little or no chance of freezing weather. 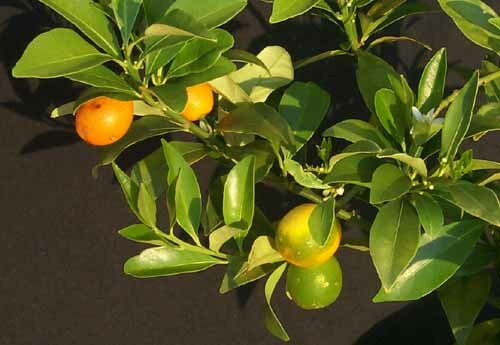 Cold hardiness is the major limiting factor for citrus production in subtropical areas. Flowers and fruit are killed at about 28°F. Leaves and stems are killed by a few minutes at 20-28 F, depending on stage of acclimation, species, and age of tissue. Flowering is induced following emergence from quiescence, and sometimes by relief from drought. • Peels become thicker and have more pebbly or rough texture in Mediterranean climates than in subtropical climates. • Peel color is best in Mediterranean climates due to cool winters enhancing chlorophyll destruction and fewer pests that blemish the peel. • Juice content is higher in subtropical than Mediterranean climates. • Acid content is higher and sugar content generally lower in Mediterranean than subtropical climates, due to warmer temperatures during ripening. Acids break down faster with warm nights, and warmer day temperatures allow greater photosynthesis. Hence, the sugar:acid ratio is higher in Florida, and fruit is said to be richer in flavor. • Within arid climates, rate of maturation is faster in hot, desert areas of California and Arizona than in cool, coastal areas. • On-tree storage is generally better in Mediterranean than subtropical climates. ‘Valencia’ oranges maintain color and quality well into the summer if left on trees in California, but will regreen if the same is done in Florida. Although citrus seedlings will produce fruit identical to the parent tree due to nucellar embryony, trees are generally budded onto various rootstocks to avoid the long juvenile period for seedlings. Budding can be performed during most of the year, when pencil-sized, round budsticks are available, and bark slips on rootstocks. Bud unions on citrus are generally higher than many other tree fruits (8-12″ above soil line) to avoid any contact of the scion to the ground. Spacings are typically 20 x 25 for grapefruit and vigorous trees, 15 x 20 for orange trees and tangerines, and 12-15 x 18-20 for limes and smaller cultivars. 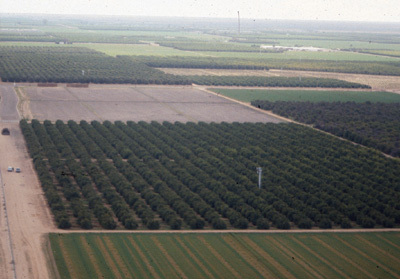 Tree densities are now about 100-110 trees/acre for grapefruit, and 130-140 for sweet orange. Training and Pruning – very little training is needed. Young trees may be headed at 30 inches to induce branching, and stripped of trunk sprouts and suckers for the first 2 years. They may be defruited for a year or two to induce vegetative growth. At maturity, trees are mechanically hedged and topped to form hedges about 12 ft tall and wide. Almost no hand pruning is done. 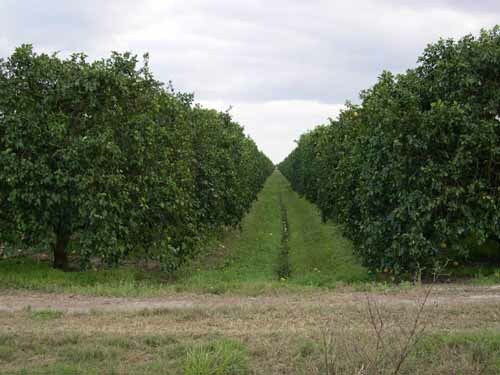 A grapefruit orchard in the Indian River district of Florida has been hedged and topped mechanically to control size. All citrus are non-climacteric fruit, meaning that they ripen gradually over weeks or months and are slow to abscise from the tree. External color changes during ripening, but is a function of climate more than ripeness, and a poor indicator of maturity. The best indices of maturity for citrus are internal: oBrix (sugar), acid content, and the oBrix/acid ratio. Citrus is hand harvested, whether processed or marketed fresh. Mechanical harvesters have been used for processed fruit in Florida and are increasing in popularity due to high labor costs and lack of labor availability. For fresh fruit, standard packing line operations are used (in order): dumping, culling, washing, brushing, waxing, drying, grading (human), sizing, and boxing. For processed fruit, growers are paid for “lbs-solids” or sugar content, based on juice analysis. Harvested fruits are culled for rot, and remaining fruit is washed prior to juicing. Juice is extracted by inserting a cylindrical strainer in the center of the fruit and compressing the fruit hydraulically. Extracted juice contains some pulp and oils, which are separated from the juice by centrifugation and screening. Juice is pooled into lots of various colors and sugar levels; some mixing is done to produce uniform product. Sales of frozen concentrate have been outpaced by single-strength juice products in recent years, due to the superior flavor of the latter. Citrus may be stored for periods of up to 1-2 months at low temperatures (32-40°F). Chilling injury is common in grapefruit, lemons, and limes when stored below 50°F, but rare in oranges and tangerines. A unique aspect of citrus is the ability to store fruit on the tree. Fruit may reach minimum maturity standards in early winter, but since they are nonclimacteric, they ripen slowly and will not soften or abscise for periods up to several months. Americans derive about 26% of total vitamin C from citrus fruits, the highest proportion from any single food group. All other non-citrus fruits contribute another 16%, for a total of 42% from fruit consumption. Citrus contributes only 0.9% of total daily calories and 1.7% of daily carbohydrate intake, despite recent efforts to characterize citrus fruits as “high carb” foods. Per capita consumption of citrus is higher than any other fruit crop when juice and fresh consumption are combined. In 2004, U.S. citizens consumed 78.8 lbs of sweet oranges (86% as juice), 7.9 lbs of of grapefruit (48% juice), 6.7 lbs of lemons (54% juice), 2.6 lbs of limes (28% juice), and 3.9 lbs of tangerines (28% juice). Consumption has been constant for most citrus fruits, except lime which has increased and grapefruit , which has decreased.